Contrary to what you may see at the movies, robots will not come to rule the world any time soon, experts say. Ken Goldberg, University of California, Berkeley professor of industrial engineering and operations research, and Otherlab CEO Saul Griffith, spoke at event focused on the factories of the future titled “Bold Bets: Tomorrow’s Industrial Entrepreneurship.” Both agreed that having humanoid-like robots in the near future should be left to science fiction. 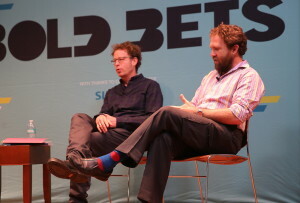 (L-R) Ken Goldberg and Saul Griffith both agree that humanoid robots are far from being ready to take over roles of humans in factories. “Machines are very good at lots of things: precision, repetition. But they are extremely bad at any type of creativity or insights,” said Goldberg. Intuition, something humans take for granted but machines simply cannot learn on their own yet, is important. And future automation systems need to be able to understand when to call for help when faced with a decision. “Machines are overweight, blind, stupid, slow and weak,” said Griffith, explaining that current humanoid robots have many huge components, cannot truly see what they are doing, only do what they are told (like playing back a prerecorded macro), and for the amount of power they demand, are much slower and weaker than their human counterparts. It takes a human about 100 or 200 watts of power to lift 30 pounds; it takes an industrial robot about 10 kilowatts to do the same action. Griffith believes these limitations need to be optimized if we are to truly have mobile and smarter robots. But there is hope on better automation and robotics: what Goldberg and others call “Industry 4.0 – the Industrial Internet.” As more robots and machines are connected to the Internet, they can be linked together to share data and software. 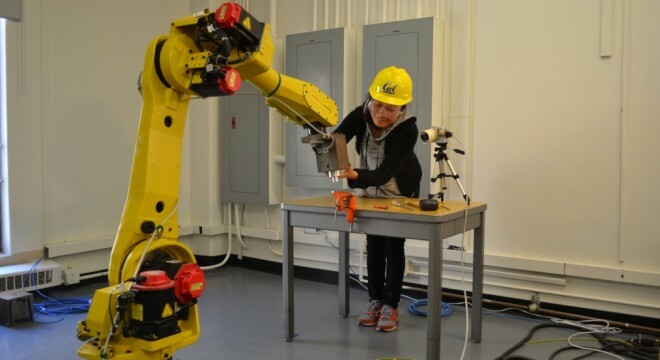 By offloading many of the complex, CPU-intensive calculations of today’s robots to the cloud, robots of the future could be lighter weight and consume much less power, with better performance. Griffith wishes that universities were even riskier and bolder, but the limitation is the availability of capital. 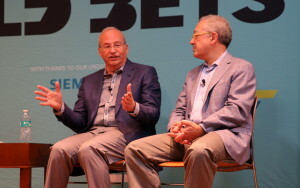 (L-R) Justin Rattner and Eric Benhamou share the stage at “Bold Bets: Tomorrow’s Industrial Entrepreneurship (And How Everything Will Change),” an event hosted by UC Berkeley and The Atlantic.